Help sustain the birds in your yard and the environment with the Audubon Premium Ranch Bamboo Bird Feeder. The traditional, hopper shape of this item provides birds a welcome dining spot, while the bamboo frame adds an environmentally-friendly touch. The center reservoir holds 1.75 quarts of mixed seed or safflower seed, and two clear plastic panels keep the feed level visible. Gaps at the base of each panel allow birds to easily reach the seed, and a perforated, metal base helps it remain dry. This screen removes easily for in-depth cleaning, and a pitched, lapped roof completes the piece. A hinge along this roof allows you to lift one side for easy refilling, and an attached cable here makes hanging the feeder simple. The frame, crafted from sustainable and renewable bamboo, ensures a durable feeder, naturally resistant to weather and insect damage. 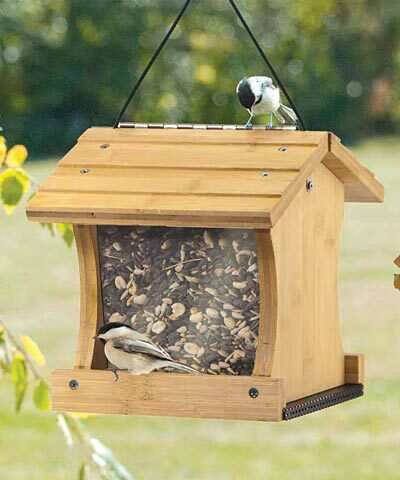 Add a fantastic, lasting bird dining spot in your yard with this Premium Ranch Bamboo Bird Feeder.